WASHINGTON (AP) — Secretary of State Mike Pompeo on Tuesday expanded the Trump administration’s ban on U.S. aid to groups that promote or provide abortions to include organizations that comply with the rules but give money to others that don’t. Pompeo also said the U.S. would cut some funding for the Organization of America States because at least one of its affiliated institutions has lobbied for abortion availability in the Western Hemisphere. Pompeo said the administration was committed to protecting “the sanctity of life” in the United States and abroad and would enforce the policy “to the broadest extent possible” by not allowing foreign non-governmental organizations to skirt the ban. Abortion rights advocates slammed the decision as dangerous to women’s health while abortion opponents welcomed it. The move is an expansion of the so-called “Mexico City policy” first established under President Ronald Reagan but rescinded by subsequent Democratic administrations. Just days after taking office in 2017, President Donald Trump reinstated the policy and then expanded it to include all health programs not just reproductive health ones. Critics of the policy that has been a hallmark of Republican administrations call it the “global gag rule.” They say it hurts reproductive and maternal health care in developing nations by cutting funds to groups that offer critical non-abortion related services to women and children, including birth control and nutritional support for infants and HIV/AIDS treatment. Pompeo denied that and said the U.S. would continue to be a leader in such aid. The U.S. spends some $9 billion to support global health programs. Abortion foes, meanwhile, hailed the step as a victory. In addition to the revision of the Mexico City rule, Pompeo said the administration would also start to enforce legislation that bars all U.S. funds from being used to lobby for or against abortion. As a first step in enforcement, support for the Organization of American States would be reduced by $210,000, State Department spokesman Robert Palladino told reporters later. Pompeo said the step came as a result of some OAS institutions promoting greater access to abortion in the Americas. 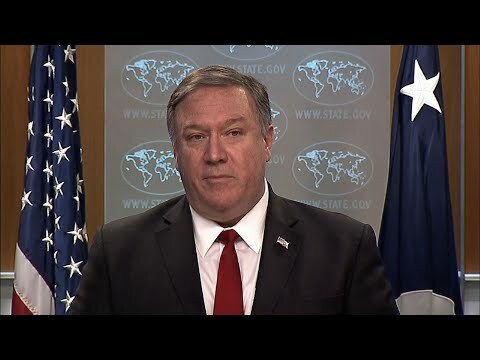 He did not identify them but some Republican lawmakers have urged Pompeo to take action over calls from the Inter-American Commission on Human Rights and the Inter-American Commission on Women for countries in the hemisphere to ease laws restricting abortion. “The institutions of the OAS should be focused on the crises in Cuba, Nicaragua and in Venezuela and not advancing the pro-abortion cause,” Pompeo said.